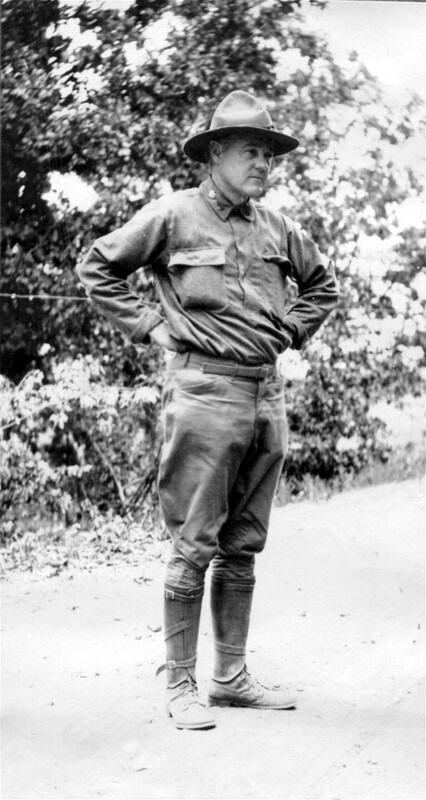 On June 14, 1917 Major John R. Fordyce departed Washington, D.C. with orders to report to Little Rock for duty as the Construction Quartermaster for Camp Pike. Major Fordyce, a Little Rock native, had been commissioned in the Engineer Reserves in April of 1917 and had been called to active duty on May 24, 1917. Reporting to Washington, D.C., he had spent the next several weeks studying the proposed standard cantonment plans. Immediately on his arrival in Little Rock, Major Fordyce met with the president of the Missouri Pacific Railroad, and within 3 day work had started on the spur to Camp Pike. Realizing that the railroad would take at least three weeks to complete, Major Fordyce constructed a road from the end of the existing railroad to the nearest highway. This one-quarter mile road was put to heavy use until the rail spur was completed on July 15, 1917. The initial construction contract was given to James Stewart and Company of St. Louis and New York and work began immediately in accordance with plans prepared by Black and Veatch, Architects-Engineers of Kansas City, Missouri . The contract was for the completion of 1,100 buildings within 90 days. During the rest of the summer a work force of between 5,000 and 10,000 worked feverishly to complete the buildings and utilities. The weekly payroll exceeded $300,000 a week. In addition to local workers, about 1,500 workers were imported from Puerto Rico and about 3,000 from Texas and Oklahoma to assist in the war construction around Little Rock. The project was receiving between 80 to 100 railcars of lumber a day; about 1,000,000 board feet of lumber received and put up each day.